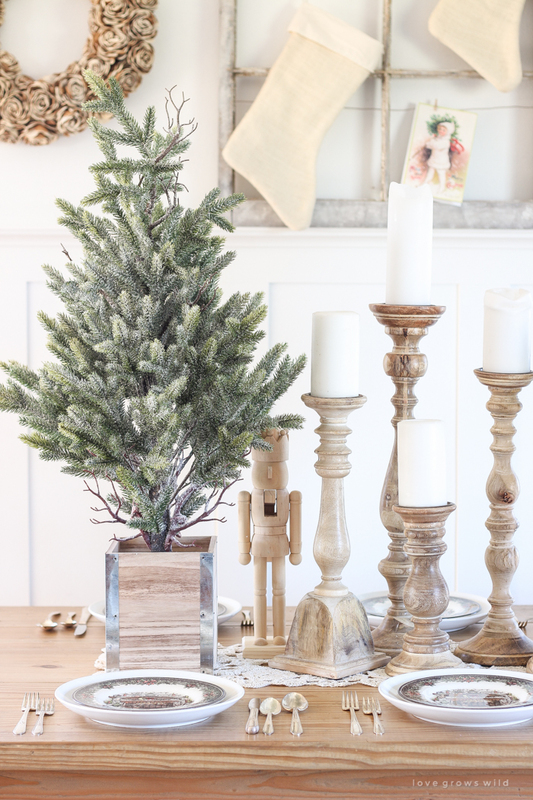 This post is sponsored by our friends at HomeGoods // Hi, sweet friends! 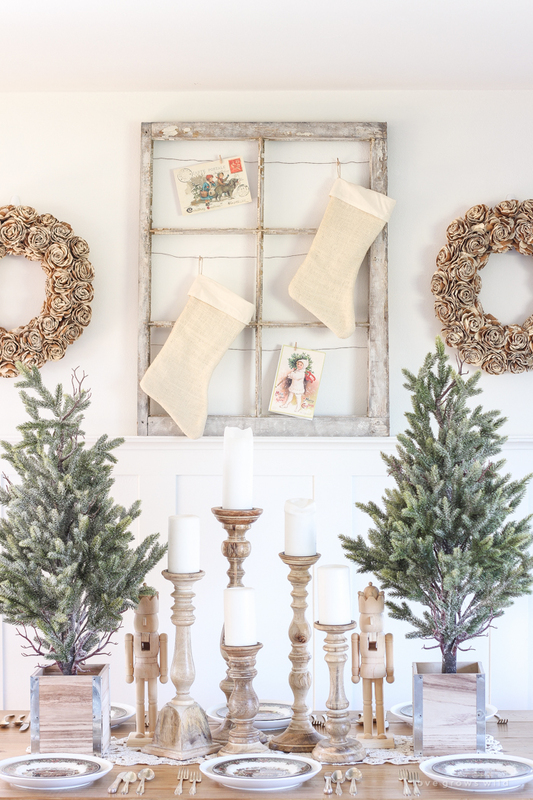 Welcome back to our Farmhouse Holiday Series! 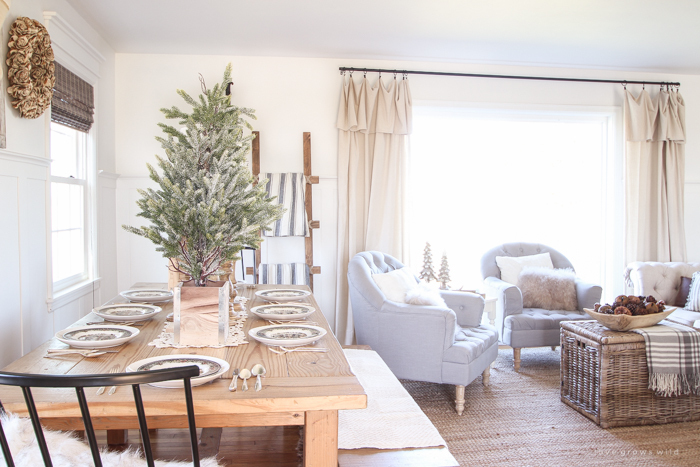 Last week I shared the first look at our little farmhouse all decorated for Christmas in our master bedroom, and today I’m continuing on into our dining room with a fun, festive table setting I put together this week. 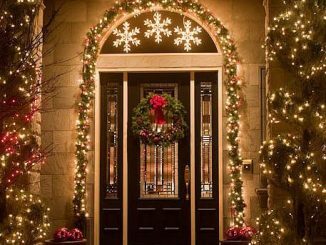 My goal this year is to share easy ideas with you for simplifying the hustle and bustle of the holidays and creating a cozy, inviting home that is the perfect backdrop to create beautiful holiday memories with your loved ones. 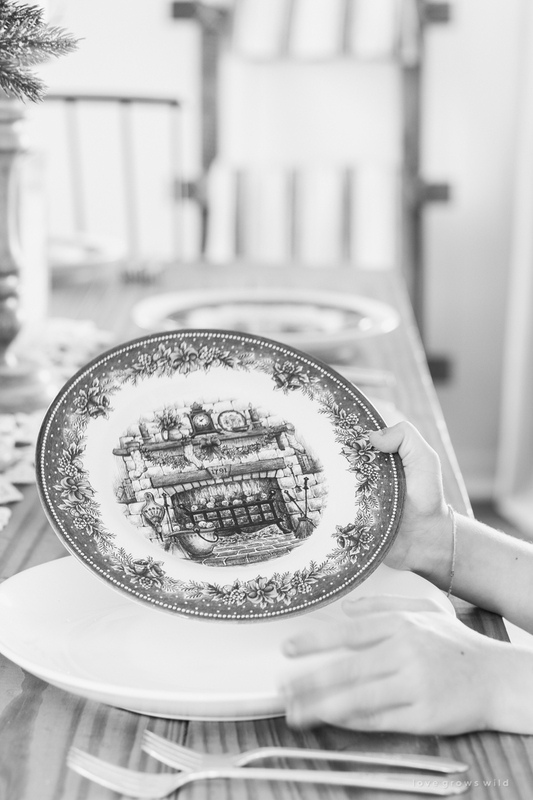 I truly hope that you enjoy this decorating series as much as I do and get some great ideas for your home! So this look in our dining room is a little more over the top than I normally do. You guys know me… I’m a less-is-more kind of girl when it comes to decorating the farmhouse, but I couldn’t resist playing with a more whimsical look for the holidays this year, especially once I found some really sweet nutcrackers and these beautiful, little trees while I was out shopping at HomeGoods this past week. If there’s one time of year that you can get away with a big, oversized table setting like this, it’s during the holidays! And lucky for you guys, I happen to have a $100 HomeGoods gift card that I’m giving away just in time to start your holiday shopping! – enter the giveaway and find product sources at the bottom of this post! 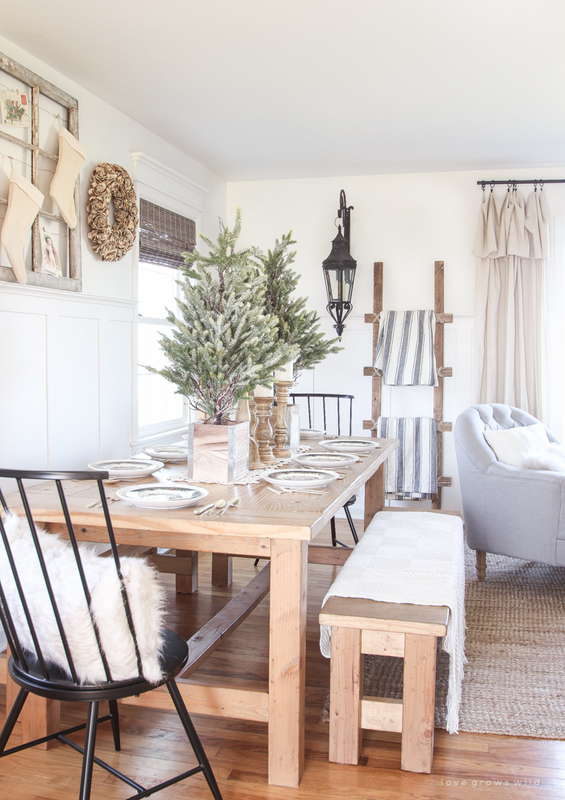 One of the reasons we built this big farmhouse table last year was to be able to accommodate all our friends and family at the holidays. It easily seats eight to ten people, and the wood grain is so beautiful that I usually don’t even bother using a fancy tablecloth. Lord knows my boys would have something spilled on it within 5 seconds of sitting down anyway! 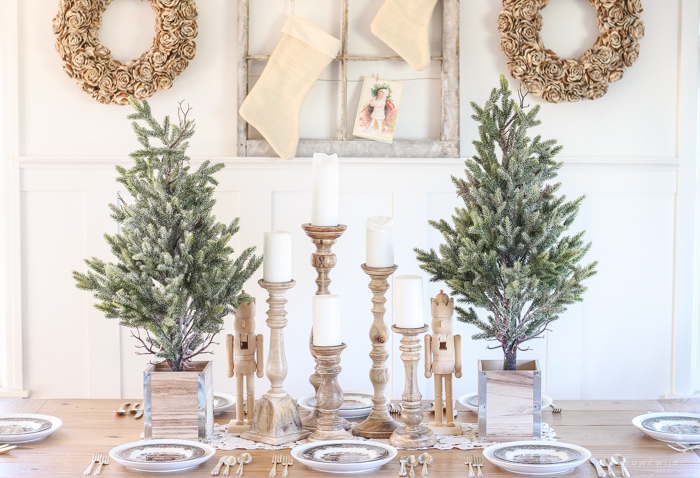 I found these darling frosted evergreens at HomeGoods and set them in the center of the table. I love that they came in these cute, little wood boxes that matched our table perfectly. 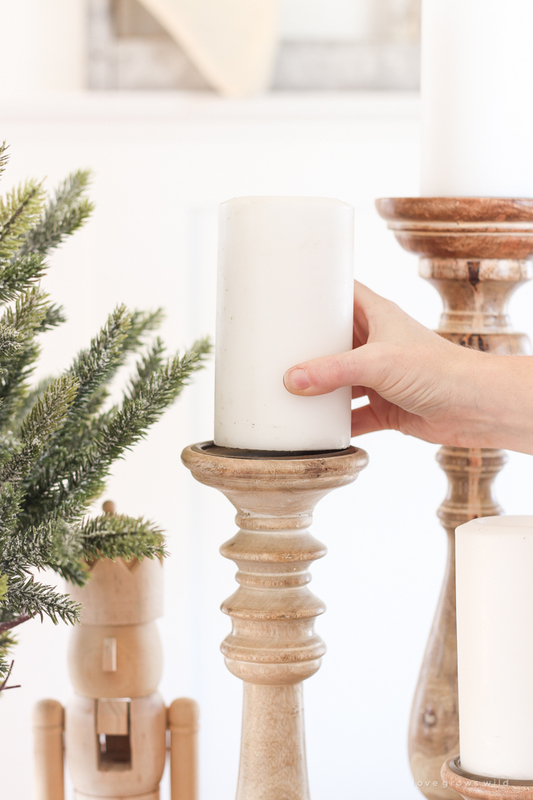 Every holiday dinner party needs a little bit of candlelight, so I added a collection of candlesticks in various heights between the trees. 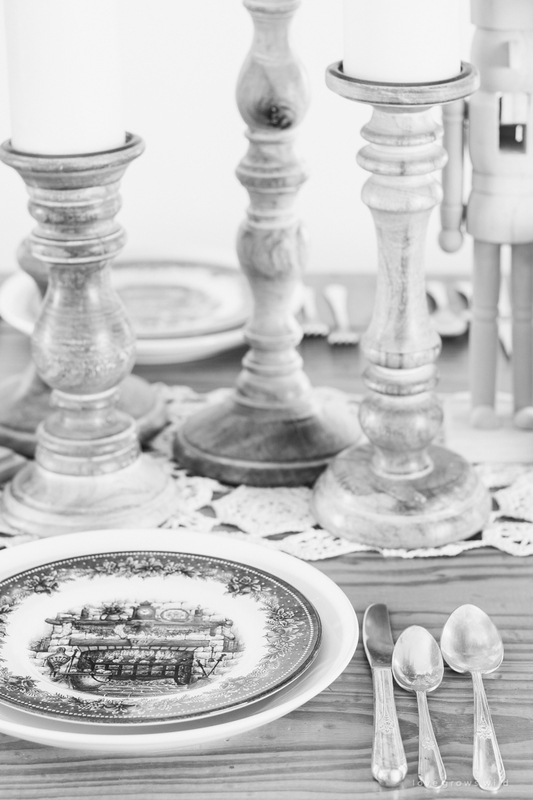 The little wooden nutcrackers fit perfectly nestled in between the candles and the trees, and I’ve already found my two little boys sitting at the table playing with them a few times this week. 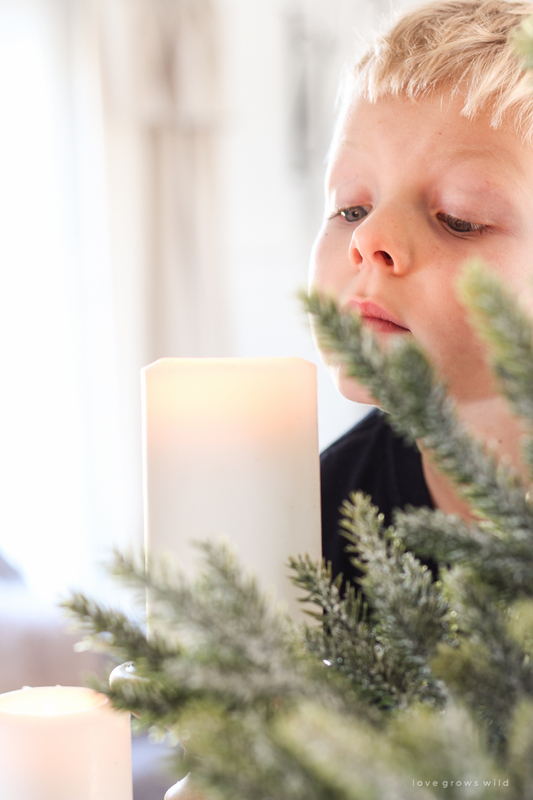 It’s seeing those little moments where the magic of Christmas comes alive for them that makes the holidays so special to me… creating memories they will cherish forever. 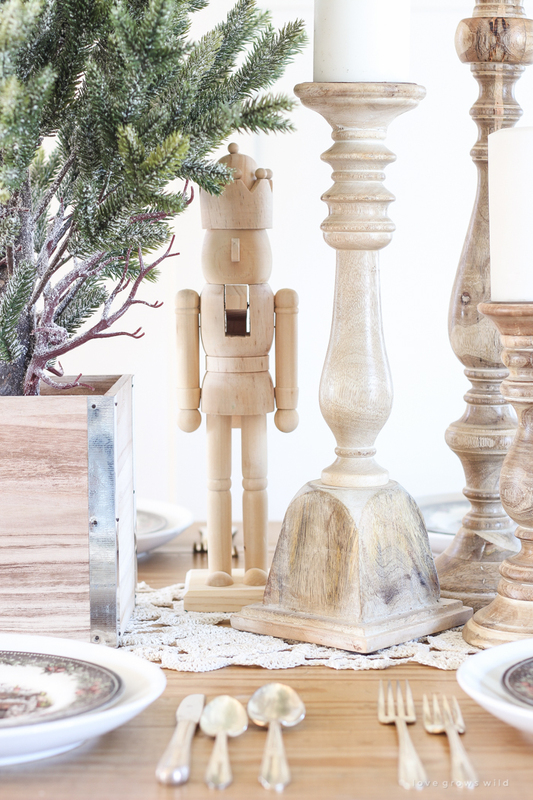 So naturally, the simple, unadorned nutcrackers have become my favorite part of this entire table setting. 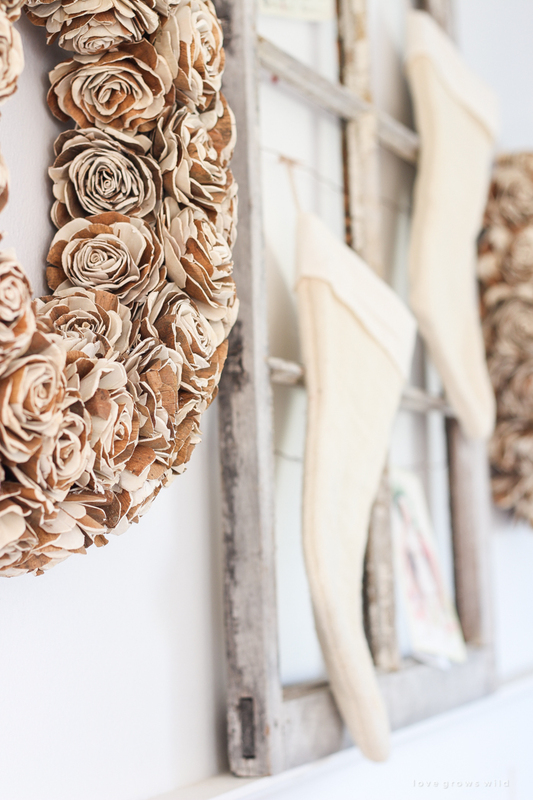 On the wall behind our table, I added two beautiful wreaths that hopped into my cart at HomeGoods. The little wooden rosettes add so much texture to the plain white wall and create such a pretty focal point in the dining room. 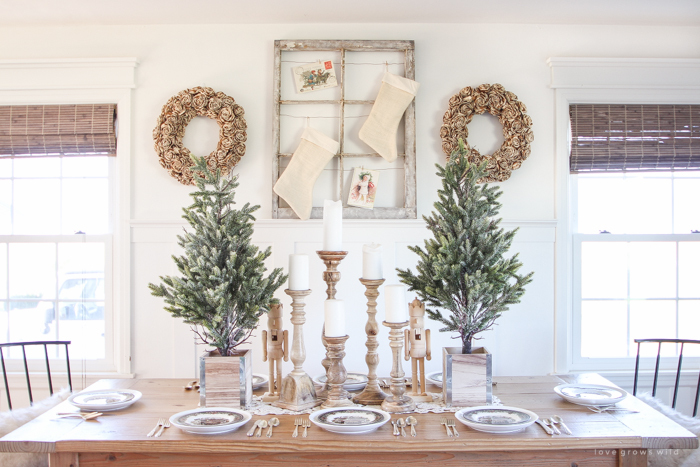 I grabbed an old window frame and rested it on top of our board and batten trim between the two wreaths. 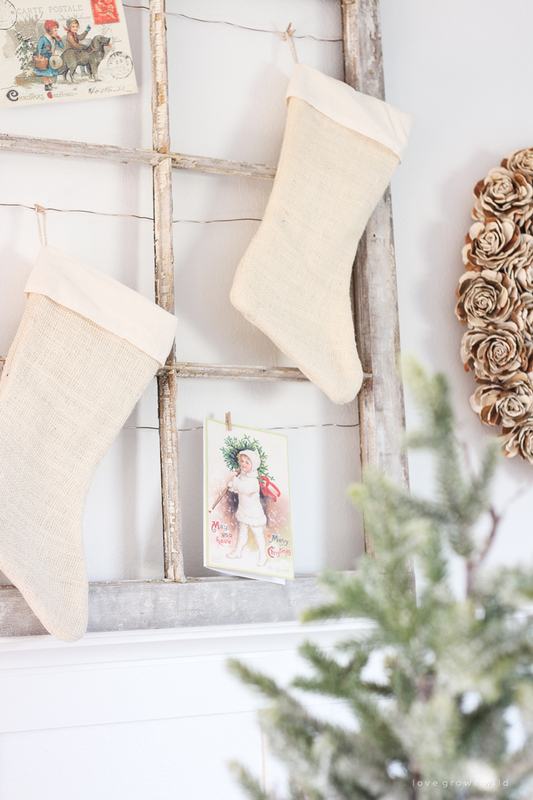 I hung two of our stockings and a couple vintage Christmas cards on the frame. Simple, sweet, and just the right amount of Christmas cheer. 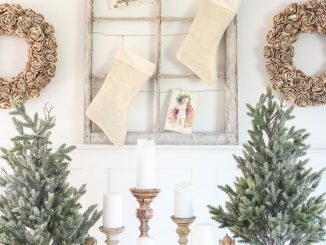 I found so many cute holiday items at HomeGoods last week that I want to share the Christmas joy with one lucky winner who will receive a $100 HomeGoods gift card! To enter, simply use the entry form below. Best of luck, guys! I’ll pick a winner on Friday! This post and giveaway has been sponsored by HomeGoods, but all thoughts and opinions are 100% my own. This giveaway is in no way affiliated, administered or endorsed by Facebook, Pinterest, or Instagram. Giveaway ends November 12th at 12:00 AM EST. The winner will be chosen by random and displayed in this post. The winner will be notified by email and will need to respond within 48 hours to claim their prize or another winner will be chosen. Winner must be 18 years of age or older and a US resident in order to win. NO PURCHASE NECESSARY. By providing your information in this form, you are providing your information to me and me alone. I do not share or sell information and will use any information only for the purpose of contacting the winner. Thank you for supporting the brands that make this blog possible! 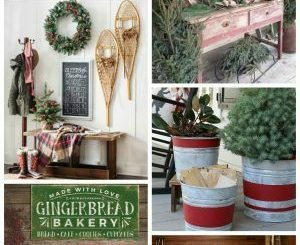 Be sure to visit the other bloggers participating in the series, and I’ll see you again soon for more holiday inspiration around our farmhouse! Note: Some of the links in this post are affiliate links, which allows me to make a small commission from your purchase, but your purchase price stays the same.Thank you for helping support our blog! curtains – tutorial inmy new book! blanket ladder – tutorial inmy new book!